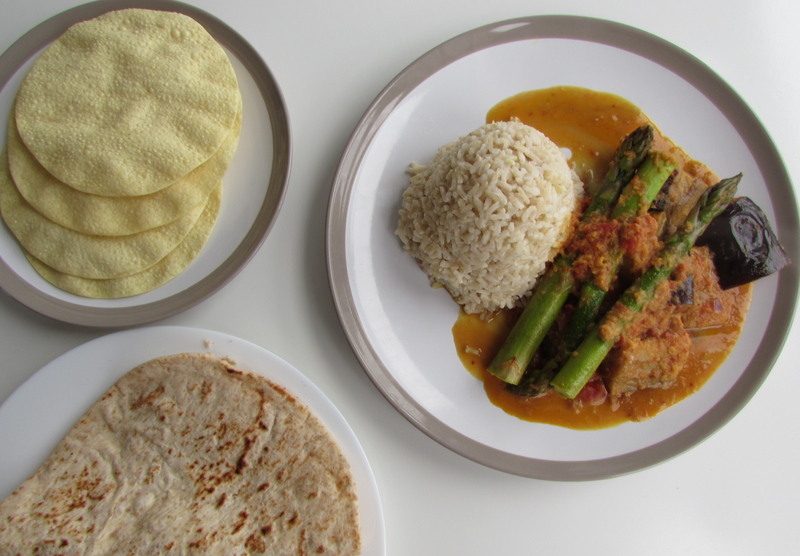 This delicious vegan curry of juicy pan-fried aubergine and crisp and crunchy asparagus is bursting with fantastic flavours from India and Southeast Asia. At the base of the sauce is a fiery homemade curry paste packed with a wealth of spices, and strong hints of garlic and chilli, which is offset by the sweet and creamy taste of coconut milk and thickening chopped tomatoes. 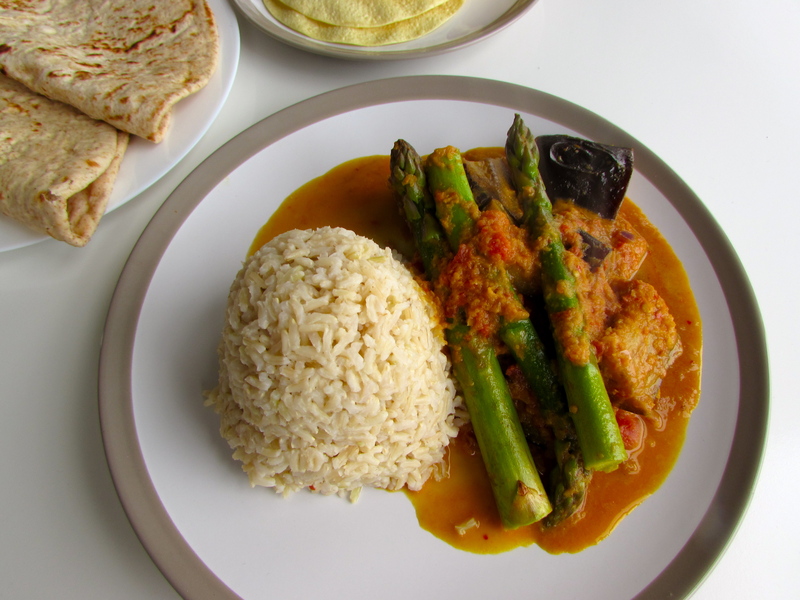 The fusion of traditional Indian spices like turmeric and cumin and Southeast Asian ingredients like coconut milk and ginger, as well as seasonal asparagus make this dish really interesting and unlike anything I’ve tasted before. Serve it with poppadoms to start and sides of brown rice and chapattis and you’ve got the perfect filling feast. It’s sweet, spicy and scrumptious – give it a go and let me know how you get on by leaving a comment below. 1. Tip all of the curry paste ingredients into a measuring jug and use a hand blender to whiz them together until they form a thick paste. 2. Take one of your aubergines and slice it lengthways, then cut each half in half again. Then slice each quarter into three. You should have 12 pieces altogether. Repeat this process for the second aubergine. 3. If you’re planning on serving your curry with brown rice, then put the water on to boil for your rice at this point. If you’re not, ignore this point and move on to number 4! Brown rice takes about 25 minutes to cook, twice the amount of time it takes white rice. I use half a mug’s worth of rice per person, with double the amount of water (my mum’s failsafe instructions). 4. Pour one tablespoon of sunflower oil into a large, non-stick frying pan on a medium to high heat. When the oil’s hot, lift the pan up and tilt round so the oil is evenly dispersed around the pan. Add half of the aubergine slices and fry for 5-7 minutes, until they start to soften and brown up. When the first batch is done, lay the slices on some kitchen roll on a plate or chopping board. Pour in the second tablespoon of oil and repeat the process for the second batch. 5. Put a wok or a large saucepan on a medium heat and add in a tablespoon of oil. Pour in the curry paste and cook for a few minutes, stirring often. Add the aubergines and mix in with the paste for a couple of minutes, until they’re well coated. 6. Pour in the coconut milk and chopped tomatoes and bring to the boil, stirring frequently. Cover and simmer on a low heat for 10 minutes. 7. Chop the woody ends off the asparagus. Add them to the pan and mix them in, then cook for a further five minutes. 8. While the curry is finishing cooking, heat the chapattis in the oven as per the pack instructions. 9. Season the curry well and serve on a large plate with the brown rice along with the chapattis, poppadoms and chutney. This recipe was inspired by and adapted from Hugh Fearnley-Whittingstall’s aubergine and green bean curry in his book River Cottage Veg. Guacamole has got to be one of the world’s best dips. Hailing from Mexico, it’s a tasty avocado-based condiment that compliments many types of dishes – from burritos to salads – and it’s healthy too. I love everything about it: the colour, the texture, and of course its wonderful flavour. This recipe was inspired by one I saw in Hugh Fearnley-Whittingstall’s River Cottage Veg – a staple cookbook for vegetarians who like fuss free, hearty food. It’s super speedy to make and goes nicely with Mexican mains like fajitas and enchiladas. Prepare the avocados: slice down the middle until you reach the stone, pull the two halves apart and remove the stone by hand or with a knife if it doesn’t pop out easily. Make a small tear in the skin and carefully peel it off each side of the fruit. Chop into small cubes. Pop the avocados into a small bowl. Add the lemon and lime juice, chilli flakes and oil and stir well with a tablespoon, until the avocados turn into a paste. Don’t worry if it’s a bit chunky; it’s good to keep some texture. Add the yogurt and stir in well until it blends in with the other ingredients. Add salt and pepper to taste and serve – depending on how messy your mixing gets, you may like to transfer the dip to a new bowl.